Watching the sunrise and sunset is always a part of my itinerary every time I go traveling. It's no different during my trip to Cambodia last August. It was almost 5pm by the time we left Angkor Wat. It had been a good first day in Cambodia, first visiting Bayon Temple and then Angkor Wat. Both of these temples had already left an indelible impression in my mind. 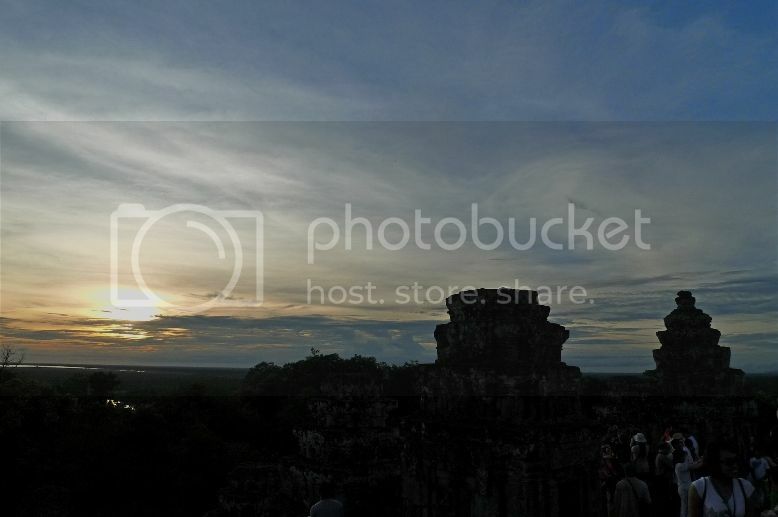 Jam, his friend and I would be returning to Angkor Wat the next morning to catch the sunrise. 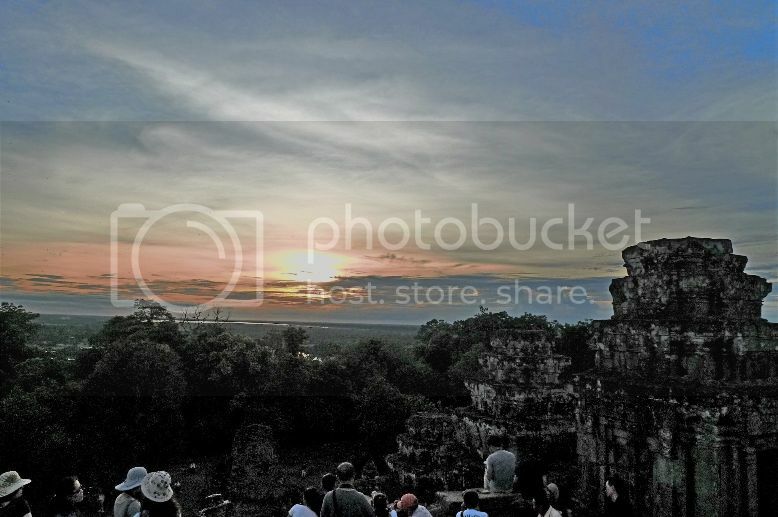 In the meantime, our driver Xiao He drove us to Phnom Bakheng to catch the sunset! 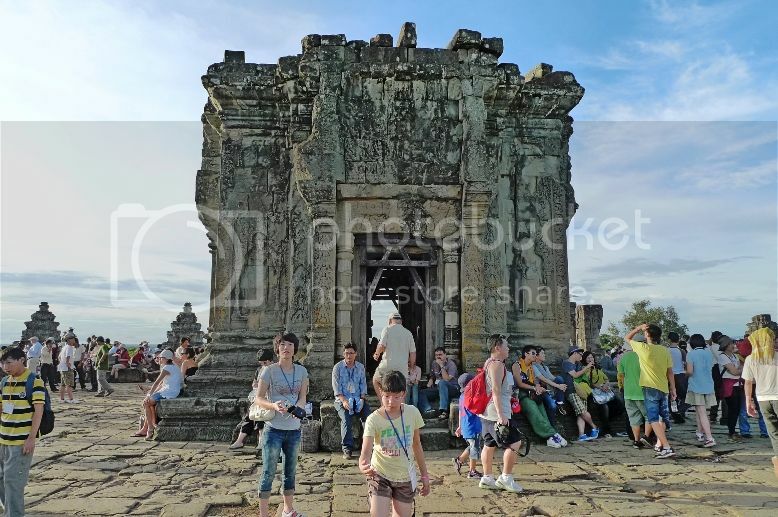 Located slightly to the northwest of Angkor Wat, Phnom Bakheng is a temple mountain constructed in the late 9th century, more than 200 years before Angkor Wat. Standing on top of a hill, this Hindu temple dedicated to Lord Shiva was the state temple of the Angkor region during the reign of King Yasovarman. 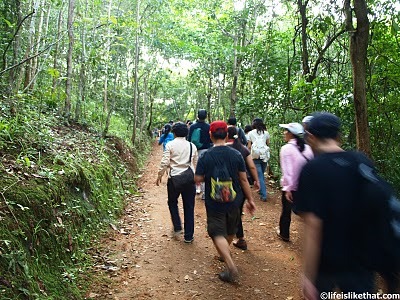 To reach the temple, we had to hike up to the hilltop. Phnom Bakheng seemed to be a very popular tourist attraction as there were many people hiking up with us that day. I forgot to take pictures of the hike so I shall borrow from Jam's blog. We reached the base of the temple about 15 minutes later. I was a little shocked seeing what was in front of me! 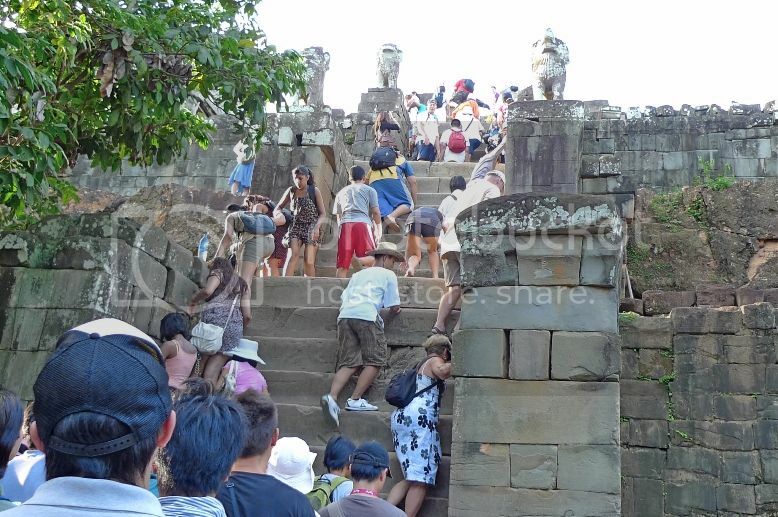 Look at these people struggling to climb those stairs!! Phnom Bakheng is actually a step pyramid with ascending square terraces. The steps were steep and quite challenging for us to climb. Each stone step is approximately 50 centimetres (or 1.6 foot) high and extremely narrow! I was worried about climbing it with my camera dangling round my neck. I did not want my camera damaged from hitting those rocky steps! I could not remember if I put my camera away inside my backpack but I remember clearly climbing those rocks very, very cautiously and with full concentration. I could not imagine what would happen if someone were to slip and fall from the top - it would be like a domino effect with everyone below rolling down those steps! Somehow, we survived the ordeal. I did not even want to think how we would be getting down later. This was what greeted us at the top. 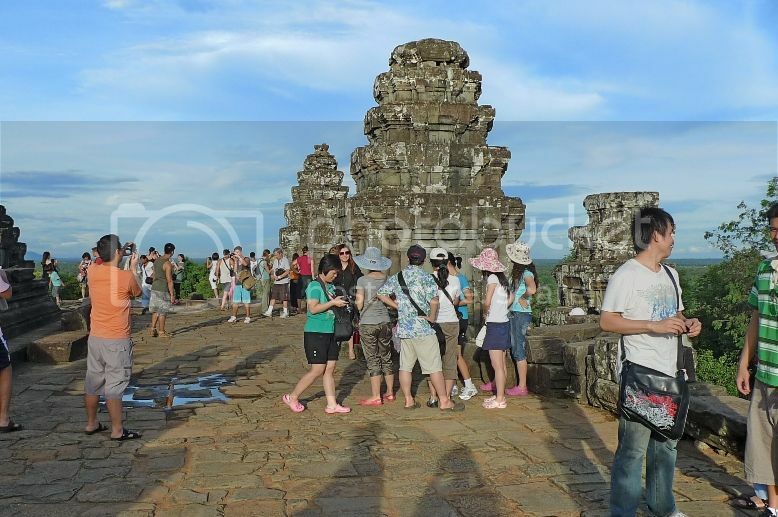 The hilltop was overcrowded with tourists. Looks like most tourists are obsessed with sunsets too! 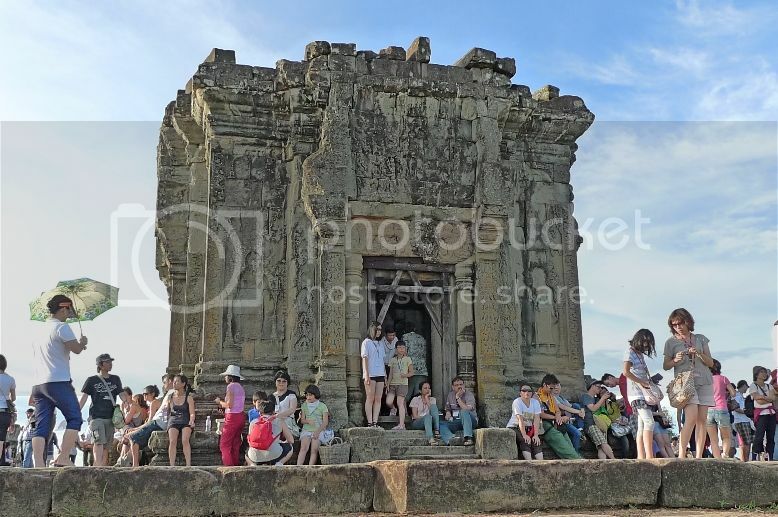 I learnt that because of the large number of visitors, Phnom Bakheng is now considered one of the most threatened monuments of Angkor. This is the Hindu temple or what was left of it. There is nothing much else to see here as most of the structures were in various states of repair. I guess most people come here not to see the temple but to catch the sunset. 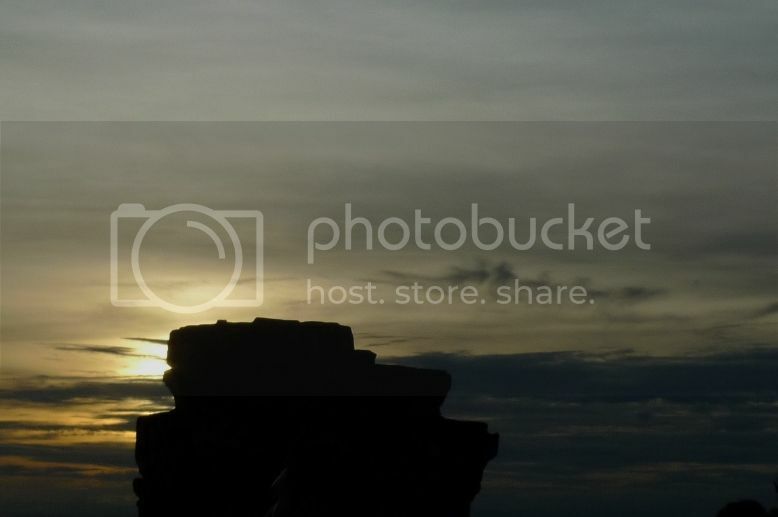 I was telling myself - after that risky climb, the sunset had better be worth it! But it was not just the sunset that drew visitors. What is significant is the view of Angkor Wat from here! Probably thanks to Angelina Jolie again! 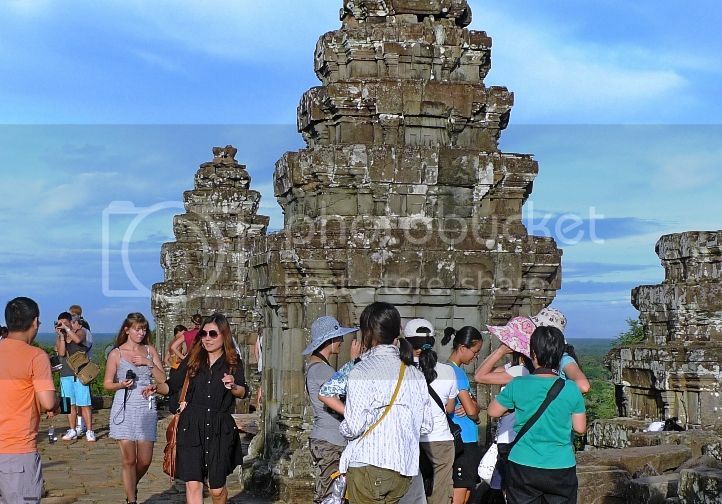 Yes, if you must know, the beautiful view of Angkor Wat from the top of Phnom Bakheng was featured in the movie Tomb Raider, where Lara Croft, the character played by Angelina Jolie, looks through the binoculars upon arriving in Cambodia. Unfortunately, I did not manage to capture the view of Angkor Wat from here as my camera was not that powerful. As there was nothing much to do, we waited for the sun to set. By 6.15pm, everyone was snapping away at the setting sun. It was difficult taking a good picture. I did the best I could. I did not find the sunset particularly fantastic or breathtaking. 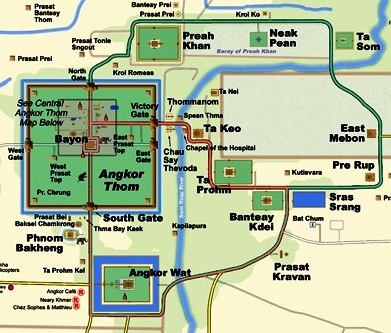 Still, as a first timer to Cambodia, I would not want to miss this for the world! We did not wait for the sun to completely set before making our move. It would be too dark to descend those dangerous steps by then. 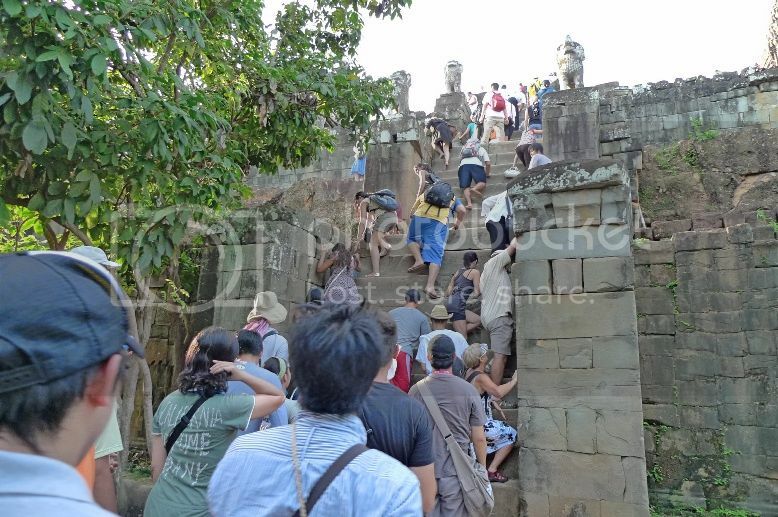 Despite the challenges climbing up and down the steep steps, I would still highly recommend visiting Phnom Bakheng for the fun of it!